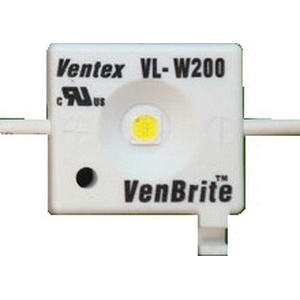 Ventex 200 series LED sign light produces 94-Lumen, 122-Lumen per Watt string and 188-Lumen per feet. The white color LED has current rating of 250-Milli-Amps DC. It provides overload and polarity protection with minimum failures. It is perfect for signs that are 4 to 6-Inch deep. It delivers brighter light than 30-Milli-Amp neon with 65 to 90% energy reduction. This series wired module has an option to reuse existing GTO and conduit. It is ideal for retrofitting Neon lit channel letters with LED. This light evenly illuminates up to 6-Inch wide stroke by reducing module counts and system costs.